A day spent with Aldi Hoxha, a man with Down syndrome from Gjakova who lives, works, hangs out with friends and plays basketball in Prishtina. The human body is made up of cells. Each cell in the human body consists of 46 chromosomes, 23 inherited from one parent, and 23 from the other. In the case of Down syndrome, an additional chromosome, or part of one, is attached to chromosome 21 if abnormal cell division occurs, and as a result, a person can have 47 chromosomes instead of 46, in each of their body’s cells or some of their cells. The term ‘syndrome’ describes a range of different symptoms that consistently occur together. Down syndrome is not a disease, so there is no medical cure for it. People affected by Down syndrome are no different from others, except for some differences in their genetic makeup. There is one thing that they can be considered different for, however — known for their sensitivity, people with Down syndrome can offer unconditional love to those around them. Aldi Hoxha is 22 years old, from Gjakova, and has Down syndrome. He lives and works in Prishtina. According to Down Syndrome Kosova, whom Hoxha has worked with on different projects, there are numerous prejudices and stereotypes that exist in Kosovo society for people with Down syndrome: they do not live very long, they have little quality of life, they cannot work, they cannot establish personal relationships. Aldi Hoxha working with organization Down Syndrome Kosova. Photo: Aldi Hoxha. Down Syndrome Kosova work towards promoting, respecting and protecting the rights of persons with Down syndrome in Kosovo, ensuring they are given equal opportunities, improving their quality of life and the lives of their families through educational programs, projects and workshops, but are provided no practical or financial support from Kosovo institutions. Failure by relevant institutions to raise awareness among the public to debunk these myths has greatly influenced discrimination against this group of people. In recent years, with the establishment of the organization Down Syndrome Kosova, there has been an increase in society’s awareness on this issue. Hoxha is a great example of how this prejudice and discrimination can be broken down. He has been educated, he works, he is engaged in sports activities, he performed in a play in his hometown. His biggest dream is to become a police officer. In May last year, he completed his secondary education at the Special School called ‘Perparimi,’ the only school for people with Down syndrome in Kosovo. After visiting countries like Albania, Germany and the United States in the past, his wish is to go to Istanbul to continue his studies. ”I’d like to be a student. To go to Istanbul and study there. I haven’t been there yet, but I’d like very much to go,” he said enthusiastically. Cafe bar X21 is located in the Pejton neighborhood in Prishtina. It is a project aimed at the professional training of people with Down syndrome. 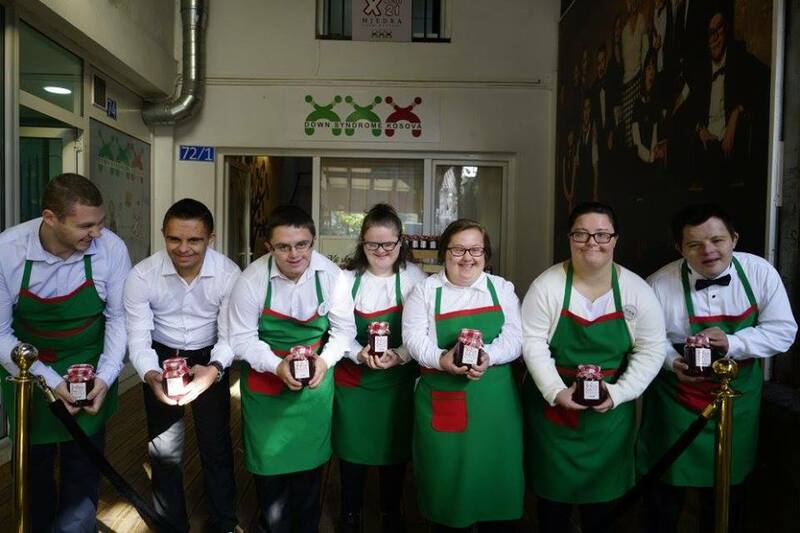 Within this project, the Down syndrome people acquire leadership, management and service skills. Hoxha works in this cafe bar and enjoys spending his free time at X21 too, together with the others that work there. 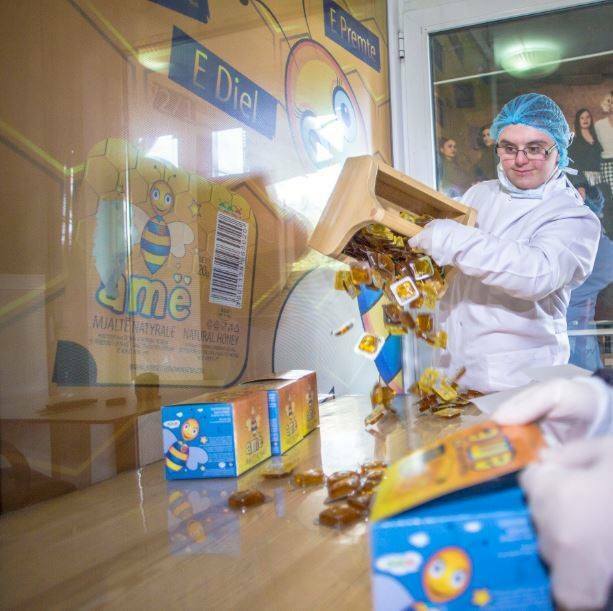 Besides the cafe bar, Hoxha works for a Down Syndrome Kosova project, packaging and selling natural honey under the brand name ‘Ame.’ This project is the first one of its kind in Kosovo that highlights the importance of employing people with disabilities in Kosovo. Hoxha and friends from the Down Syndrome Kosova project. Photo: Aldi Hoxha. According to Down Syndrome Kosova, provided they are given proper education and therapy from an early age and helped towards being able to lead an independent life, like any other individual, people with Down syndrome are able to lead a successful working life. Hoxha is also very active in sports activities. 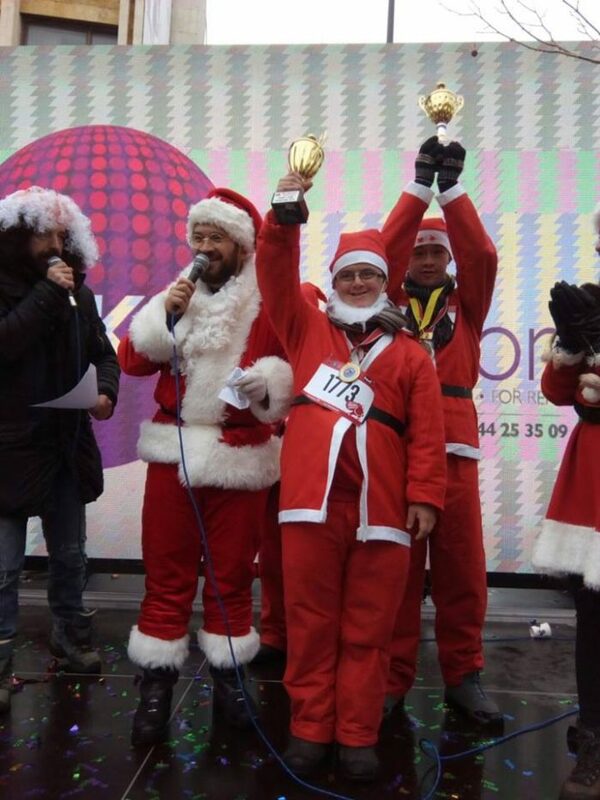 Recently, he was part of the humanitarian mini marathon, called Vrapo Babadimer, held on December 16 in Prishtina, where he won first place, and was awarded with two medals and a cup as well. In addition to basketball, he said, he likes football too, running off his favorite teams. ”The three teams that I like the most are Milan, Liverpool and Juventus. Milan wins occasionally, so Liverpool is better. Juventus has Ronaldo, a top model,” he said, adding that he is also a member of the Prishtina swimming club. Aldi Hoxha wins mini marathon. Photo: Aldi Hoxha. 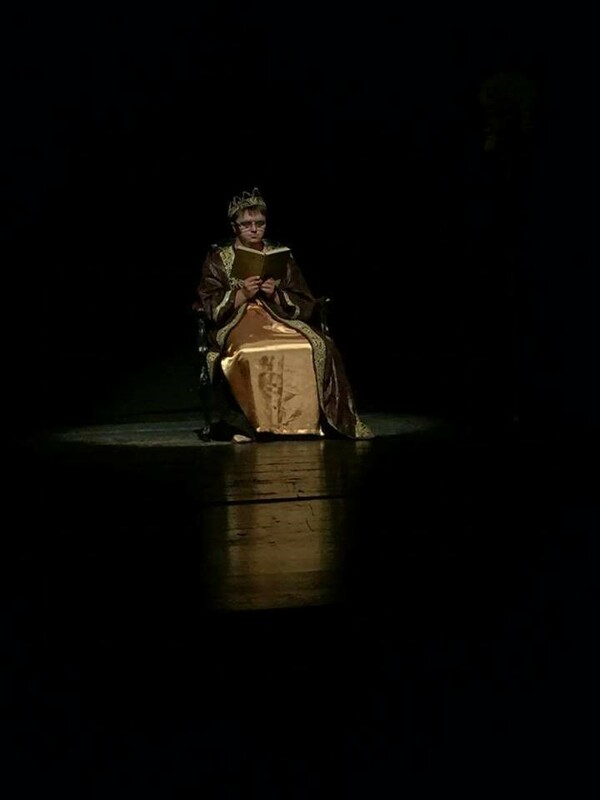 Two years ago, Hoxha played the role of the king in a play in Gjakova. According to him, the text was difficult to learn. ”I played the role of the king. I found it rather difficult because I had to learn the text by heart. But the text wasn’t long one,” he said. According to Hoxha, the most important people in his life, apart from the family, are his friends in the cafe bar. Hoxha performing as the king in a dramatic production in Gjakova. Photo: Aldi Hoxha. As far as music is concerned, Hoxha likes to listen folk music only. Even further, he only listens to folk music from Gjakova. “I listen to folk music from Gjakova only, and I have three favorite singers. They are Shkelzen Jetishi, Zenel Doli and Korab Jetishi,” said Hoxha, starting to sing one of their songs. Even though it is a state obligation to ensure that everyone is included in the education system, little is done in Kosovo, and inclusivity in the education system has never been a priority. The Down Syndrome Kosova said that their projects and educational programs are funded by subsidies, donations, successful proposals to different institutions and the profits they make from the sale of products. “Our organization is funded by project proposals, individual and business donations, subsidies and by the sale of manufactured products. We have received the support from the Government only on the basis of the project proposals. As a summary, people with Down syndrome do not have sufficient support from the state institutions,” they said. The fact that people with Down syndrome are not different from others is so apparent from spending time with Hoxha. These people, simply, need more support and attention than others do. And, in response, they give something that is priceless: they give unconditional love.